Clang Clang Clang Goes the Trolley! 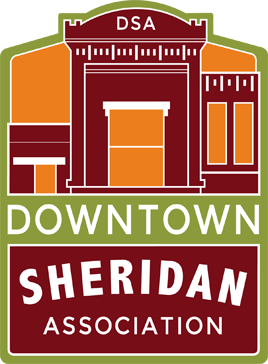 had a route running through this region, there lacked train service between Sheridan and the nearby coal fields. In early 1910, Albert Emanuel and William Sullivan, of Dayton, Ohio, proposed to build and operate a local electric streetcar system that would run through the town, and serve as a direct line to the coal mines. The city fathers quickly approved the proposal, and on July 11, 1910, construction began. In just over one year s time, the “City Line” was completed. It s path began at the railroad station and wound its way down Main Street. 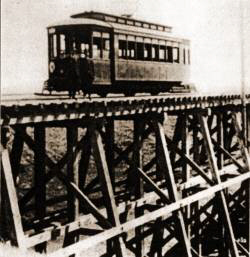 With the arrival of three “rubber stamp”, deck-roof streetcars, service began on August 11, 1911. Car number 10 was chartered opening day by a local men’s club. They hired a brass band and draped a banner reading ‘The Buisness Mens Club” over the side. In the rush and excitement of the day, the word “buisness” was misspelled, but the city-wide celebration was not dampened. The town was, indeed, very proud of its newest feature. Following the tremendous success of the City Line, a second route was established. “Fort Line” was an extension from Main Street, up Lewis Hill to the county fairgrounds and then out to Fort Mackenzie (present day VA Hospital). This route, which had to cross the dreaded Dead man s Draw, opened for service five days after opening of the City Line. Local rail service expanded even more on November 25, 1911, with a route from town all the way to the coal camp of Dietz. The 12-mile route was completed in February 1912. The total system had some 18 miles of track which included a short spur from the end of City Line to the old Sugar Factory on Coffeen. Over the years, the system operated with no additional changes, and operations were fairly routine. 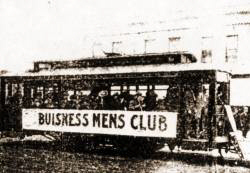 The trolley became the pride and joy of this booming mining community. 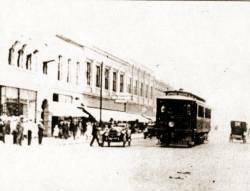 However, in 1923, the city decided to repave downtown Main Street. It was also decided that the stretch of double track on Main Street would not be replaced due to decreased passenger counts. So, in September, 1923, service on the City Line was discontinued. The Fort Line continued to operate until March of 1924, when it was replaced by a bus. That left the coal mine routes to carry on as the last remaining electric railway in the state. However, it too was abandoned in April, 1926. Even though the street cars had a relatively short life span, their story lives on. Some fifty years after the cars made their last runs, the dilapidated body of one of the cars was discovered in a field near town.